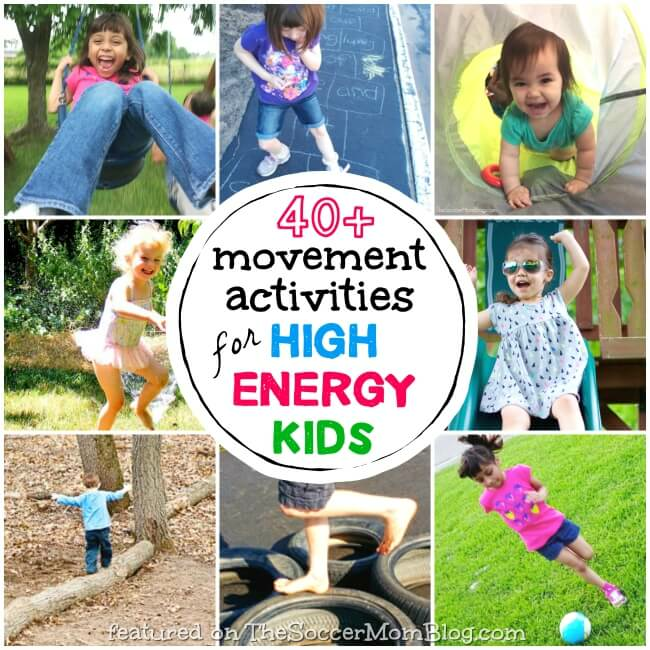 You’ll love this list of more than 40 summer kids activities that are sure to get the whole family moving, playing, and learning! Summer is in full swing and while it’s wonderful to have lots of free time to spend together as a family, it also puts more pressure on me to find things to keep the kids busy! Incorporating physical activity helps everyone release energy and ensures that bedtime is a breeze. Note: I’ve included ad links to items that we love and use in our own lives; read our disclosure policy here. Without further ado, check out our favorite summer kids activities that get kids moving and exercising! Such a simple thing, but I treasure these daily strolls with my girls! We have a designated route that we take and we enjoy seeing what’s new in the neighborhood. Take turns re-enacting and guessing your favorite characters from movies, books, or even real-life people. You can make it easier for the little ones by imitating animals instead. Sounds are ok and encouraged! 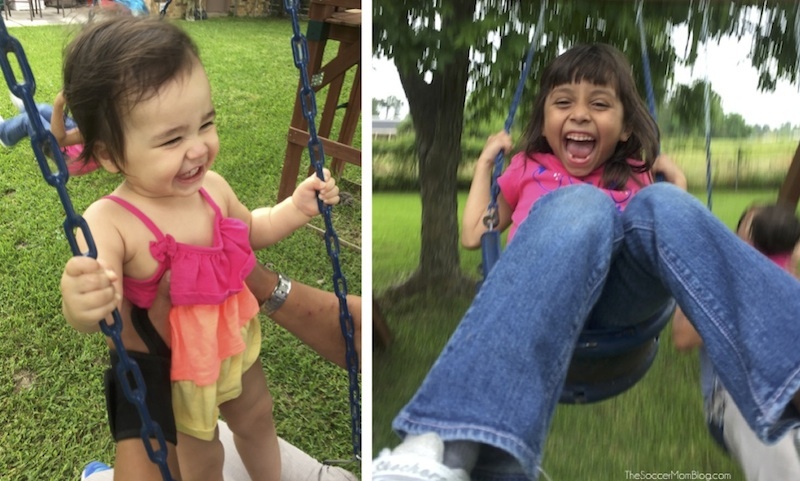 Some days it’s just too hot (especially here in Texas) to be outside, but that doesn’t keep us from having a good time! Nothing works better to instantly improve everyone’s mood that our favorite “jams” and getting silly in the living room. Wear the kiddos out and calm them down at the same time. Yoga has so many positive mind and body benefits and it’s not just for the grown-ups! Try this ten-minute yoga routine with your kids. Whether indoors or out, a scavenger hunt adds some creative thinking and problem solving to the mix! Check out the indoor scavenger hunt we made with my daughter’s Sofia the First figurines here. Another versatile activity that can be done outside or inside (ideally in a big open room with no breakables). Use household items to climb over under and around. The possibilities are endless! Looking for inspiration? Check out these printable summer obstacle course cards on Adventures in Wonderland. This classic schoolyard game never goes out of style! Kids LOVE to get wet! Even if you don’t have access to a swimming pool, there are plenty of alternatives: sprinklers, baby pools, even an outdoor misting fan ! 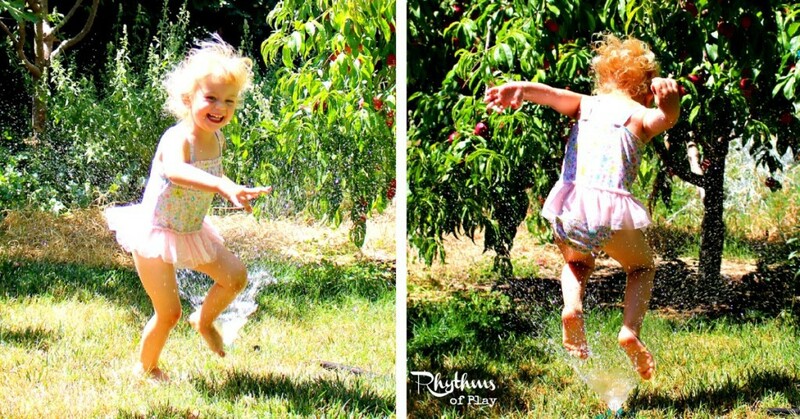 You can have fun AND teach about water conservation: check out these tips for being water-wise from Rhythms of Play. Related: Make the most of your trip with this Playground Workout for Busy Moms! You don’t have to use real instruments, we all know pots and pans will do just fine! Parade around the house trying different steps and rhythms. I’ll be your kids will be very excited for an invitation to make noise! Do you belong to a neighborhood pool? Know a friend or family member that has a pool in their yard or apartment complex? Are there mommy and me swim classes in your city? If you are able, swimming is the perfect exercise and way to beat the summer heat! Or tricycle, or scooter… you get the idea! We had one of these in my basement growing up (I believe it was a piece of exercise equipment abandoned by my parents) and we kids made excellent use of it! We were always bouncing or vaulting over the backs of couches (ok, don’t do that one!) These days they make kid-safe versions, like this Little Tikes 3′ Trampoline . This was one of my absolute favorite things to do in elementary school and my girls love to hit the neighborhood rink too! Just remember your safety gear! Yet another fun way to stay cool and burn some energy! See how far you can stand from your partner and still make the catch. There are no losers in this game, even if you miss you get a burst of refreshing water! We found these Bunch ‘O Balloons water ballon filling kits (as seen on TV) and YES they really do work! Makes filling up dozens of balloons much easier! Don’t worry, this doesn’t involve jumping off anything! Remember that game in school where you sat in a circle holding a big sheet and puffing it up and down? 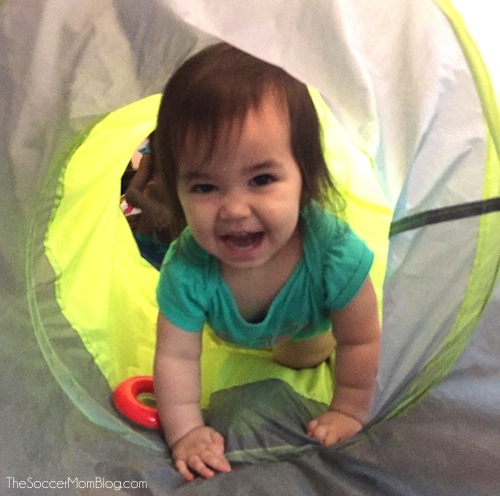 Take turns crawling under the sheet while it’s in the air and trying to get out before it comes down. Like parachute, but you put beach balls or even wadded up scrap paper on top of the sheet and “pop” them in the air. You can make a game of trying to keep all the balls on the sheet, or trying to pop them all off! I love this Multiple Level Learning Hopscotch idea from 3 Dinosaurs! It allows a range of ages and skill levels to participate and practice their letters or sight words. What’s not to love about combining exercise and education? A classic, but always a hit! My girls have been on a hide and seek kick lately, playing almost every single day. Another classic: an individual or group activity that teaches coordination. Plus it is an amazing cardio workout, so parents, feel free to join in and incinerate some extra calories! You don’t have to pay to go to the bowling alley to knock down some “pins!” Driveway bowling is free and a great way to recycle water bottles! Put about a half inch of water in the bottom to keep them in place between turns. Another activity that I loved when I was younger! My friends and I built tree houses (with the help of our parents) in each of our yards and spent hours upon hours improving them with rope ladders, swings, and the like. Whether you call it soccer, fútbol, or football, this sport is one of the best exercises you can find and offers lots of varying opportunities for play! Have a penalty kick contest one day and a dribbling drill the next. My oldest daughter got an Inflatable Soccer Goal for her birthday and it’s been a huge hit! 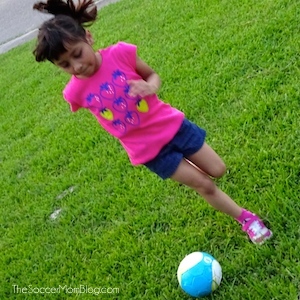 Even the littlest tykes can join in with a mini soccer ball! An excellent gross motor skills exercise combined with customizable learning challenges from Mosswood Connections. Draw a board with sidewalk chalk and kids themselves are the game pieces, moving through the board as they roll the dice! Remember when you and your friends used to make up elaborate handshake routines, sometimes involving songs? Take turns creating the most unique “handshakes” you can think of– the more spins, twists, turns, claps, and snaps the better! How many steps can you do without forgetting one? You’ll definitely want to supervise this activity, but kids are sure to have a blast walking a few inches taller! Click here for instructions on The Quiet Grove. Create obstacles and practice strength exercises, just like the do on the popular TV show that’s a hit with kids (and grown-ups!) See more tips and photos on Steam Powered Family. Another spin on the sidewalk classic, courtesy of Teach Me Mommy. See how to use foam number mats to set up your game here. An inexpensive craft using kitchen sponges will get kids running around (and staying cool) on hot summer days! See how they’re made on Messy Little Monster. Take family game night to the next level with the awesome collection featured on Wunder-Mom. Life-size checkers, Jenga, and more! See all the games here. Make a life-sized maze with all natural materials – kids will love this free activity and spend hours setting up maze after maze! See how it’s done on Mother Natured. Hit the trails to get some exercise and fresh air! You never know what you’ll spot along the way. Check out these tips to inspire kids and teens to go hiking on Outdoor Families Magazine. Also known as “kick the can” or a variety of other names, depending on where you grew up. A cross between tag and hide and seek, you can even play indoors if the weather is yucky. Can’t remember the rules? Get a refresher courtesy of Sloely.com! See how it’s done at Look! We’re Learning. We had a small balance beam in our basement growing up and it kept us busy for hours at a time! Playing with a balance beam is wonderful for practicing gross motor skills, coordination, and of course balance! See tips for finding and playing with a balance beam at Mommy Evolution. 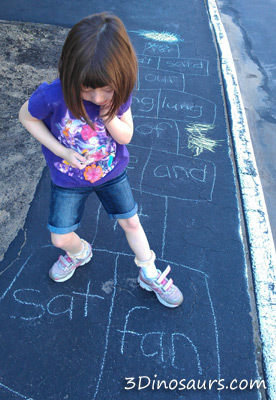 A no-prep scavenger hunt activity that teaches kids how to mark trails for others to follow. Not only do kids get active, but they learn survival skills too! See how it’s done at There’s Just One Mommy. A unique twist on the idea of an obstacle course – kids must complete activities before moving on to the next stage of the course. Grab ideas for your active learning course at Buggy and Buddy. One of many summer kids activities inspired by the book The Big Bunny Hunt, “follow the bee” is a fun combo of “follow the leader” and an obstacle course. Learn how to set it up at Babies to Bookworms. Kids especially love this movement game because there are lots of rules to remember (and invent as you go along!) Think of the silliest requests possible and let your imaginations run wild! Forget how to play? Refresh your memory at Sloely.com. 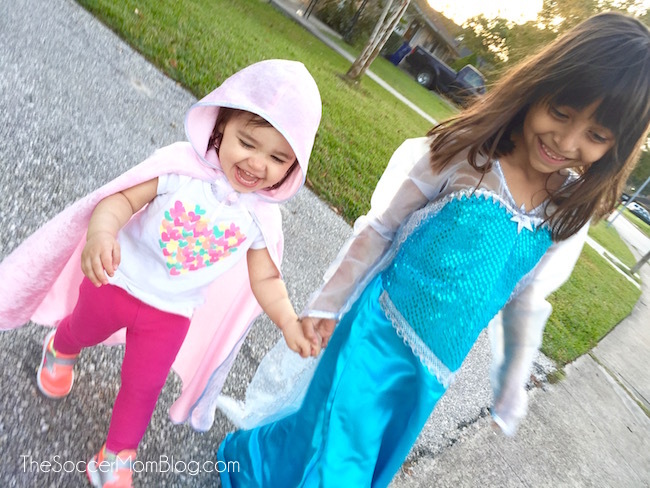 My girls love to dress up in Halloween costumes year-round and act out scenes from their favorite Disney movies and storybooks. Take the imaginary play outside for fresh air, or use it as a way to burn some energy if you’re stuck cooped up indoors! 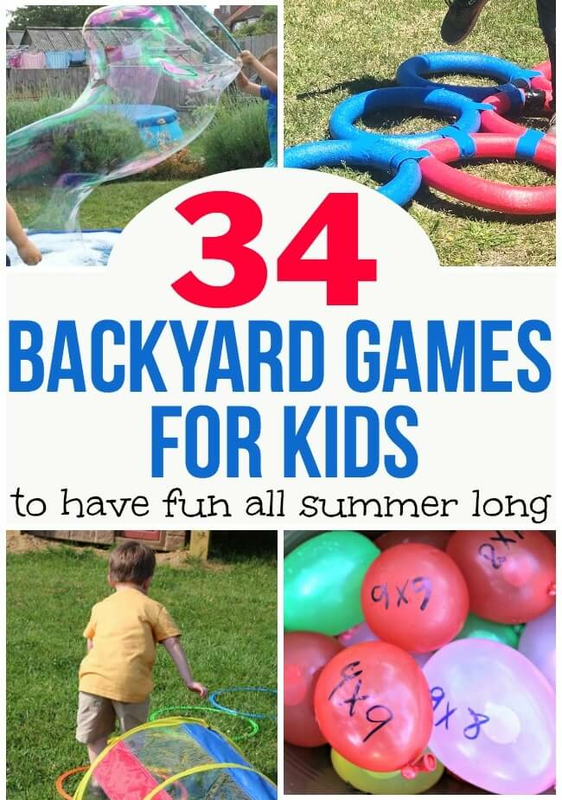 These summer kids activities will keep you and your kids busy for many hours! What do you have planned for summer? Keep the fun going all year long with these Olympics Activities for Kids to celebrate the Winter Games! 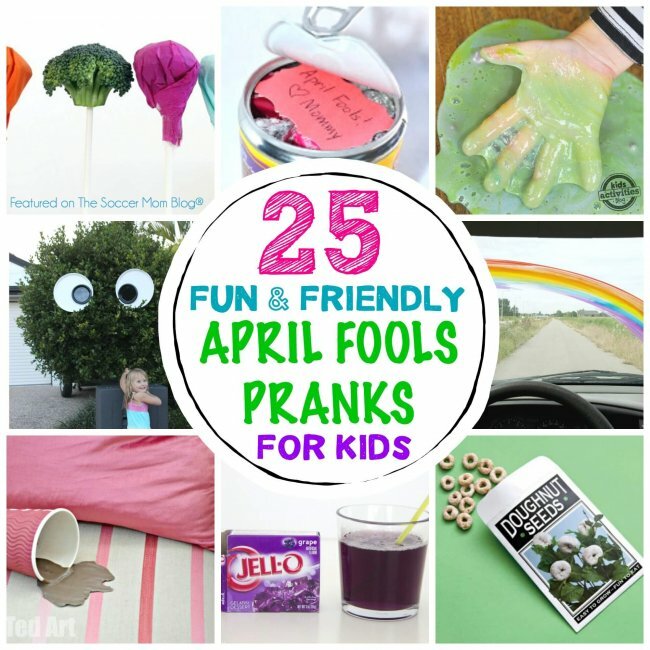 Be sure to check out our BIG list of good-spirited April Fools Pranks for Kids too! There are so many fun ideas here! I can’t wait to get outside and get started on this awesome list of activities. Thanks for sharing the post and letting me include your game! Yes! A win-win for sure! This is such an amazing list! You did a great job gathering so many interesting activities for children!